George Karl Wentzlaff was born on May 3, 1946 in Los Angeles, California. He took (or was given) the stage name George Winslow and was billed as George “Foghorn” Winslow is several of the feature films he appeared in during the 1950s. Films, I might add, in which he often took the spotlight away from the likes of Cary Grant and Marilyn Monroe. No matter how small the part or whether it was just one scene in which he appeared, George was always memorable. He is my favorite child in film. Although George Winslow is probably best remembered for his (undeniably) unique raspy voice, hence the “Foghorn” moniker, he also had a wonderful, deadpan delivery and demeanor that baffled the adults he played against in his movies, a fact that remains endlessly entertaining. 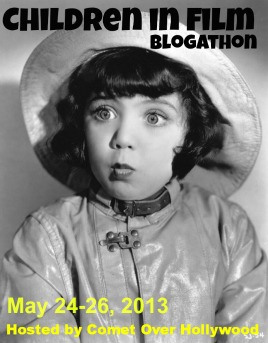 I chose George Winslow as the topic of this post, which is my contribution to the Children in Films blogathon hosted by Jessica at Comet Over Hollywood, primarily because I love watching him in movies. However, I was also interested in learning all about him and his life, but I found nothing. Long searches yielded no information, no trivia or behind-the-scenes snippets I could latch onto. So, I had no choice but to make this solely a retrospective of George’s career, which lasted a total of six years during which he appeared in ten feature films. George Winslow made his feature film debut in 1952 with Norman Taurog’s, Room for One More in which he co-stars with Cary Grant and Betsy Drake (who were married at the time). 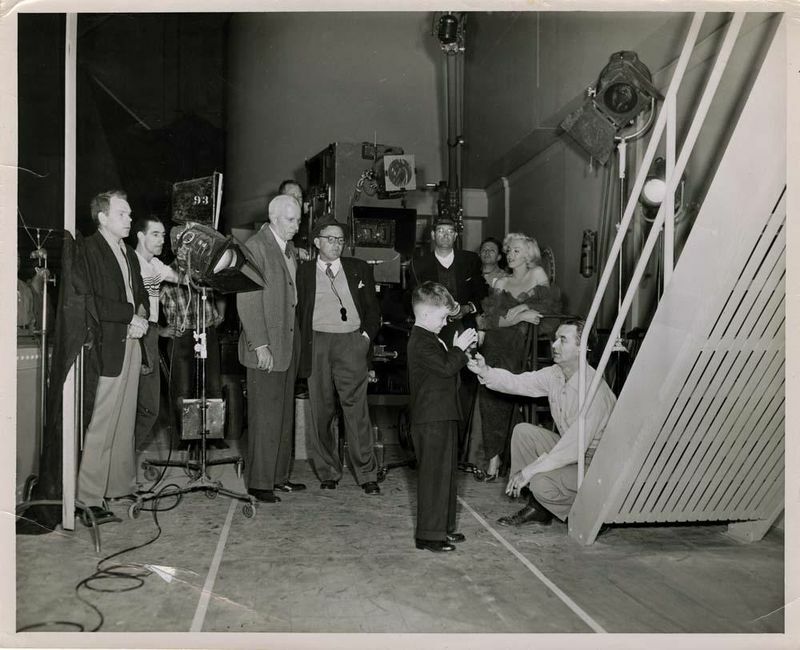 The story goes that Cary Grant had seen the 6-year-old George on Art Linkletter’s, “People Are Funny” television show and found him so amusing that he recommended the child for the role of Teenie, the youngest member of the Rose family in Room for One More. Room for One More is based on the true story of a big-hearted couple who have their hands full with three children of their own yet can’t help but take in two troubled orphans as foster children. The film is a fun and heart-warming family story, replete with tantrums, misadventures and heart. But the standouts, not surprisingly, are Mr. Grant and Mr. Winslow whose scenes together are my favorites. Also in 1952, George appeared, albeit in a much smaller role, in Howard Hawks’, Monkey Business. His role as “Little Indian” required he again play opposite Cary Grant in their second and last film together. Following is a scene from Monkey Business featuring George as the Little Indian. No doubt you’ll recognize the distinct voice…“Ya gotta do a war dance first” – but if I may add that besides the voice, note his tone – an adult one to a degree – that distinguishes his talent above everyone else’s in the scene. He is so noteworthy because his delivery is superb – a child playing on par with adults. What was it that W. C. Fields said? It would certainly pertain to the likes of George Winslow. Winslow’s third picture in 1952 was to be his only starring role, as Gus Jennings in Robert Parrish’s, My Pal Gus. Just as I would do for Room for One More, I’d categorize My Pal Gus as a dramedy but with less heart…and no Cary Grant. 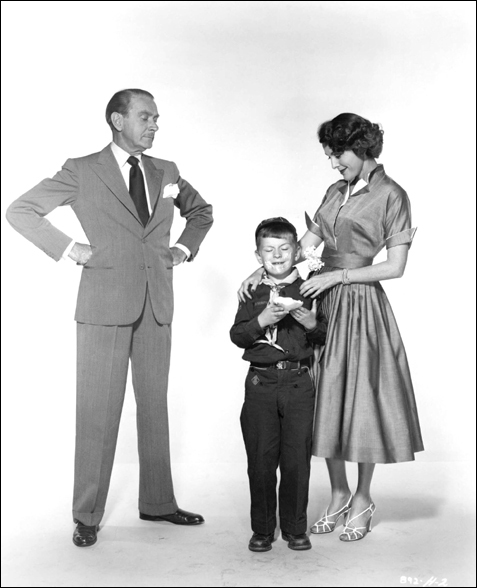 This film is about a successful business man (workaholic), Dave Jennings (played by Richard Widmark) who can’t control his (brat) son (Winslow) so he puts the boy in a progressive school. 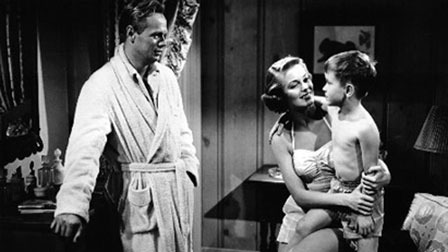 The teacher at the school (played by Joanne Dru) improves the boy’s behavior and becomes romantically involved with the father. Some other complications ensue and ultimately My Pal Gus is fun to watch. But it’s mostly standard fare. Again here, the best part of the movie is George Winslow. Winslow’s next film feature is by far the most popular and my favorite of his roles – as Henry Spofford, III in Howard Hawks’, Gentlemen Prefer Blondes (1953). This film also, by the way, features my favorite Marilyn Monroe performance. Her comedic talents are in full bloom in her depiction of Lorelei Lee, the gold-digging blonde bombshell. And George Winslow steals scenes from her. No joke! After Blondes, George co-starred – in another meaty role – with Clifton Webb and Edmund Gwenn in Henry Levin’s, Mister Scoutmaster (1953). This is the one George Winslow film I hadn’t seen prior to choosing him as the subject for this blogathon. I enjoyed it. 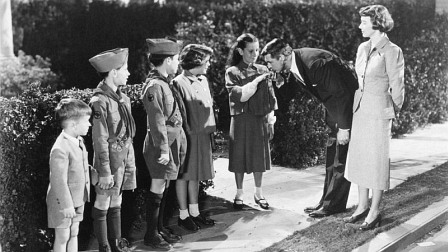 Scoutmaster is light-hearted fare, not quite as heart-warming as are his first two films, but Mr. Winslow is quite good in this. Again, he steals almost every scene he’s in and plays well opposite the pompous Clifton Webb. 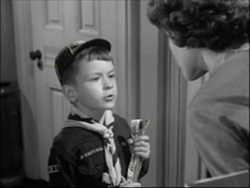 Mister Scoutmaster is about a snobbish television star (Webb) whose show is losing young viewers so he decides to become a Scoutmaster in hopes of getting to know his audience. 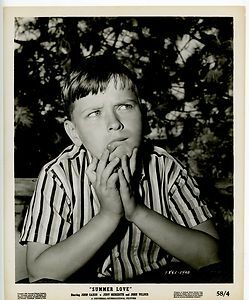 Young Winslow, billed in this and his next two movies as George “Foghorn” Winslow, plays Mike, a boy from the wrong side of the tracks who longs to have a normal life with a normal family and does so through the Boy Scouts and the new Scoutmaster. 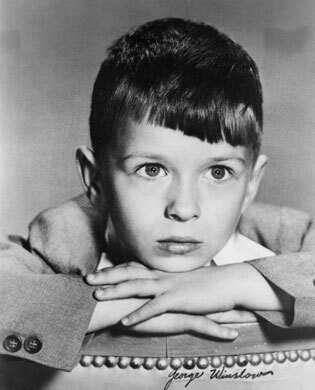 In Oscar Rudolph’s, The Rocket Man (1954), George Winslow’s next film, he plays Timmy, a boy who comes into possession of a ray gun that compels anyone caught in its beam to tell the truth. There are many complications in this somewhat silly romp, which has the requisite heart-tug involving an orphanage, but this one is a great example of the cast far outweighing the story as far as ‘watchability’ goes. Aside from George Winslow who, again has several memorable moments in the movie, Rocket Man also stars comedy greats Charles Coburn and Spring Byington, two actors I can watch in anything. You might note that George Winslow is hailed as “Marilyn Monroe’s favorite boyfriend” at the beginning of this as an attempt to capitalize on the popularity of Gentlemen Prefer Blondes, but note also that he is clearly marketed as the star of this film alongside a pretty impressive cast. In 1955 George Winslow starred is what is (arguably) his last “good” movie with Frank Tashlin’s musical comedy, Artists and Models, which stars Dean Martin, Jerry Lewis, (newcomer) Shirley MacLaine, Dorothy Malone and other notables. Winslow plays a small, but memorable role here, which – in a real sense – marks the beginning of the end of his acting career. If one considers marketing important in show business then the fact he’s not even mentioned in the film’s trailer is a clue. 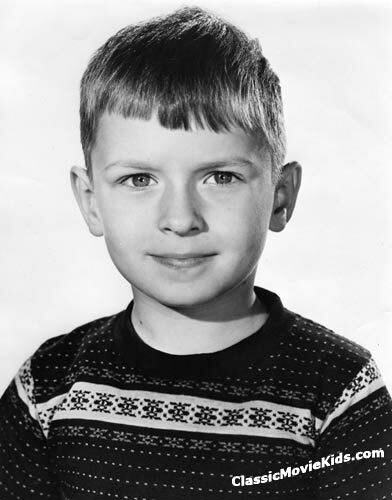 George next played small roles in Richard Bartlett’s, Rock, Pretty Baby in 1956 and Charles F. Haas’, Summer Love in 1958 as the same character, Thomas Daley, III. He made his last appearance in a feature film in Charles F. Haas’, Wild Heritage in 1958 playing Talbot Breslin, one of three Breslin sons in a Western about a family who crosses the plains and encounters lawlessness and values along the way. George Winslow retired from acting in the late 1950s after making guest appearances and a few recurring roles on television shows like “The Adventures of Ozzie and Harriett” and “Blondie.” He resorted back to his birth name and, by all accounts, is living happily in California. I read in many places that as the distinct voice that got him attention grew into a common voice as the actor matured, George Winslow had little choice but to step away from the screen. Roles didn’t come to one who sounded like all the others. Although it may well be that Mr. Wentzlaff was perfectly happy leaving the limelight (I sure hope so), still I’m saddened for us. His was a great talent aside from the voice. 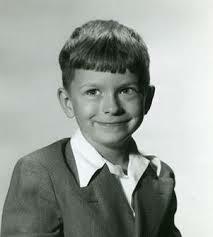 This child in films had an adult’s sensibility, an adult’s comedic timing and great screen presence. A cool character, I’d like to think some great roles were waiting for him down the road. But, I’ll have to be satisfied with the few roles he did do in the few films I’m always happy to stop and watch whenever I see they’re on. 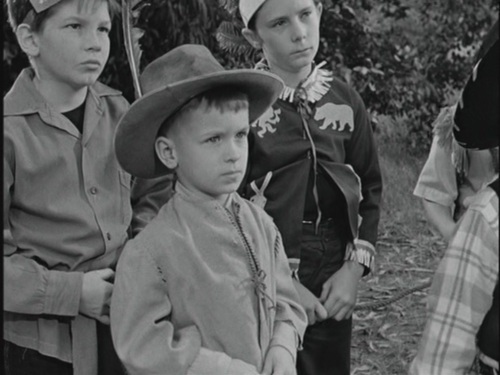 For Children in Films this is the short, but stellar career of the boy Winslow. As mentioned above, this post is my contribution to the Children in Films blogathon hosted by the uber-talented Jessica at Comet Over Hollywood. Please visit her site for many more posts dedicated to other memorable Children in Films. Great review and photos,especially the rare on the set ones. What a shame we know nothing of his life after Hollywood. I must seek out My Pal Gus. I guess George will always be remembered for Gentlemen Prefer Blondes. Thanks for this comprehensive look at his film career. Thanks, Vienna! I actually reached out to the man who wrote the mini-bio of George in IMDB to see if he can guide me with contact information for the actor. I never received a response. 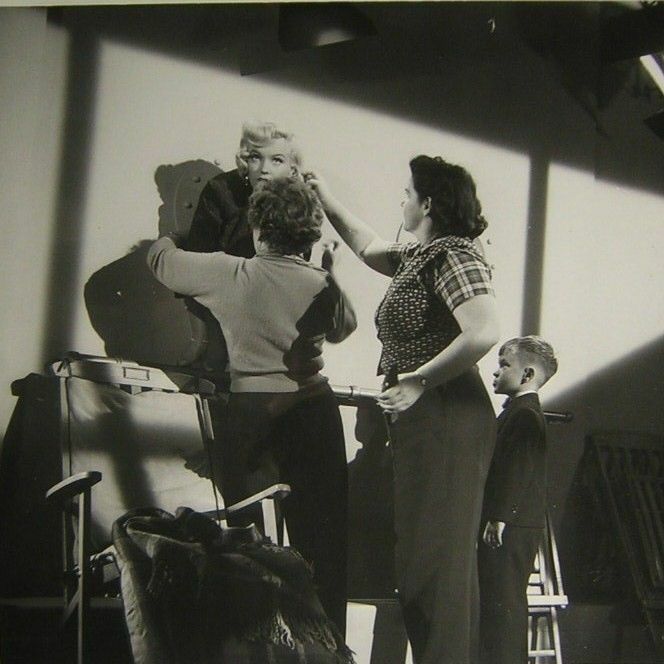 I hate to intrude on anyone’s life who chose to leave the limelight but thought perhaps he wouldn’t mind sharing a few memories of working with Cary or Marilyn. I may not give up those efforts. We’ll see what happens. His obituary in the Santa Rosa Press Democrat 6/21/15. 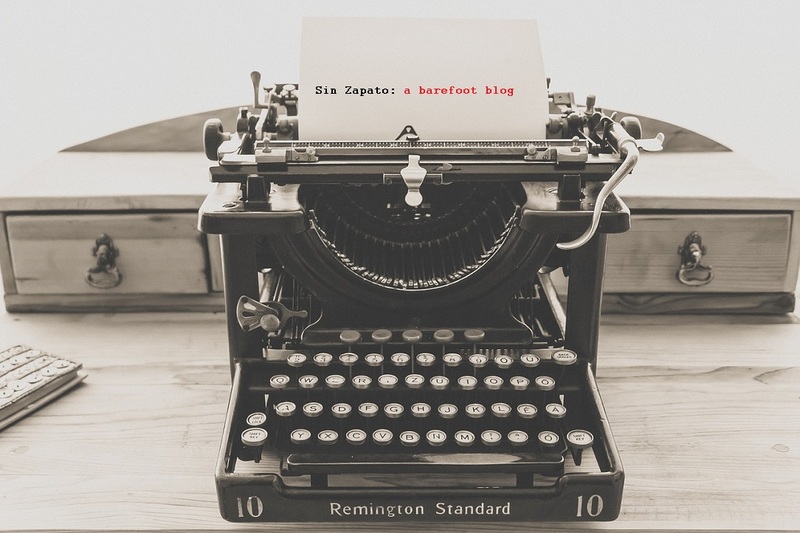 Stumbled across your blog looking at old video clips to refresh my memory on the news of his passing. Thanks for that. It’s so sad. I’ll share that link with the classic film community. Aurora, delightful, informative profile of a young actor that many classic film fans recognize…but undoubtedly know little about. SO glad you like this, Rick! Thanks for stopping in. The kid cracks me up! Very much enjoyed your look at the actor and his time. Thanks, Patricia. He was a total hoot! I love this kid, and am so glad you covered him for the blogathon. I`ve never seen Room for One More but after reading your post, I`ve gotta see it ASAP. Fun movie – definitely see it. 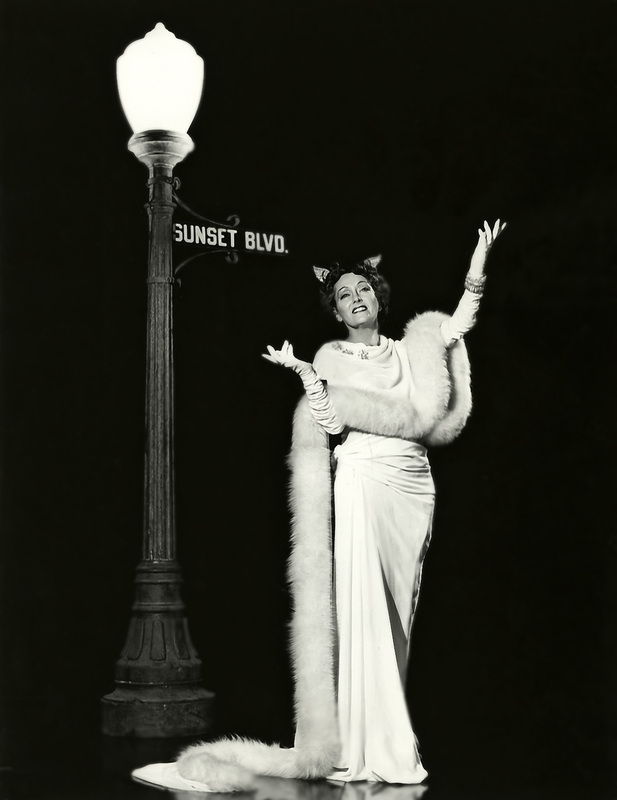 I just saw it for the first time last year when it aired on TCM. 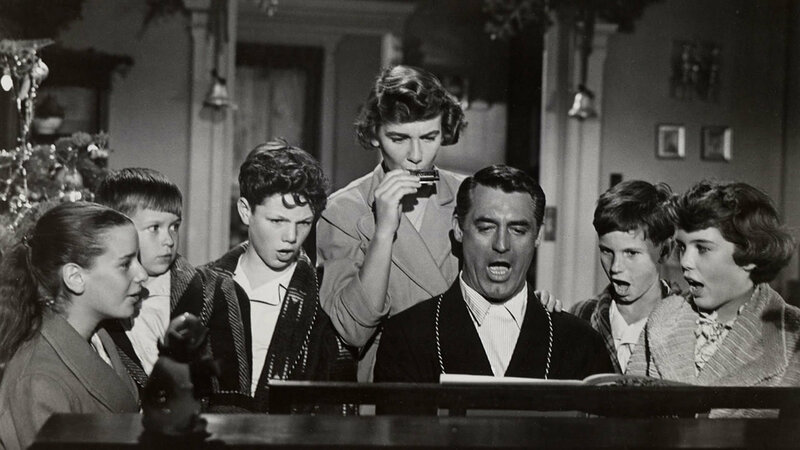 How can you go wrong with George AND Cary Grant!? That picture of George and Marilyn is heartwarming and precious. His scene in “Blondes” is hilarious. I will say the first time I saw the movie, I was disappointed because in the book, Henry Spofford III is actually an adult so I thought “what the heck?” But regardless, the bit in the film is very funny. Thanks for hosting this great event, Jessica. My pleasure to take part. The behind the scenes pics were wonderful to find given I couldn’t get my hands on anything else regarding George. I love that one with Marilyn as well. I didn’t know Henry Spofford was an adult in the book. I wonder if the part (as a child) was written for Winslow? I have to look into that now! I’ve always loved George – most especially in “Gentlemen Prefer Blondes.” Lucky boy to have appeared in one of the great classics of a movie legend – it’s a film that will be aired and screened forever. I wondered if his voice remained a “foghorn” (he’s probably lucky that it didn’t) – lots of interesting information here. Good selection, Aurora. He was fun to take a look at in any case. Wish I’d been able to get some background information. And I agree, the one film he’ll be remembered for is Gentlemen although his part is tiny. What a cutie and a fabulous little performer! Thanks for the write-up. I enjoyed your mini-reviews immensely too! Thanks! He certainly was a fabulous performer. Wish he’d done a lot more. Great post! He is one of my favorite child actors. His scenes with Cary in Room for One More are so fantastic. That film turned me into a fan. Yes! Love that movie. Thanks! Worked with george the past 15 years great guy will miss him immensly, he passed away june 12th 2015 age 69. Often spoke about his child acting experiences. Oh no!!! I knew nothing about his passing. I can’t tell you how sorry I am to learn that. Hi Jeff, we don’t know each other but I’m glad he had some folks up north that will miss him. Did that sound odd? It’s just that he was such a recluse. I only heard yesterday of my old friend’s passing. Wally as we called him, and I met in 1973 while both studying photography. He was charming and funny and wonderfully odd…and remained so all through the years. We spoke a month ago when he called…which was nice, as reaching him by phone was no easy feat. We spoke of military memorabilia, post office stories, his old Meeker house that burned, Foghorn Winslow impersonators, and….what else?…,cats cats cats! It was a great trip down memory lane and update on recent goings-on. I told him he should write a book, he was such a great story teller but he his past history very very close, sharing only with friends. If you’ve any more new to share Jeff please don’t hesitate to contact me. Hi Gary, we just heard Walrus (as we always called him for that big mustache he wore) had passed. Nice you had a chance to talk with him lately, it’s been a couple of years since we last spoke. He always had that big belly laugh and would have you laughing in seconds. He was writing a book, it was among his loses in the fire, along with mementos from his acting days. He was a good storyteller, I have a story he emailed a long time ago he’d written about when he was living with us – he was our roommate in three houses from 1974 to 1980 before moving north. Another lifelong passion for him was his interest in trains. How timetables could be so engaging was beyond me, but my brother understood that side of him. I remember him telling me about being a little guy meeting Walt Disney. He didn’t care so much about meeting the man but sure did like his trains. Easy going, always wearing a smile and a great conversationalist, he will be missed. It’s nice seeing all of these old pictures and to know so many people appreciated his talent. I’m abolutely crazy about Cary Grant playing Indian in Monkey Business. It’s the funniest part of the movie, and Winslow is the funniest child in the group. What a distinctive voice! I didn’t pay a lot of attention to him in Gentlemen Prefer Blondes, since I was looking more at the brunette Jane Russell. I’m simply crazy about Cary Grant doing anything, Le!! 😀 Will go over to read your post as soon as I can! Great post and a great choice! 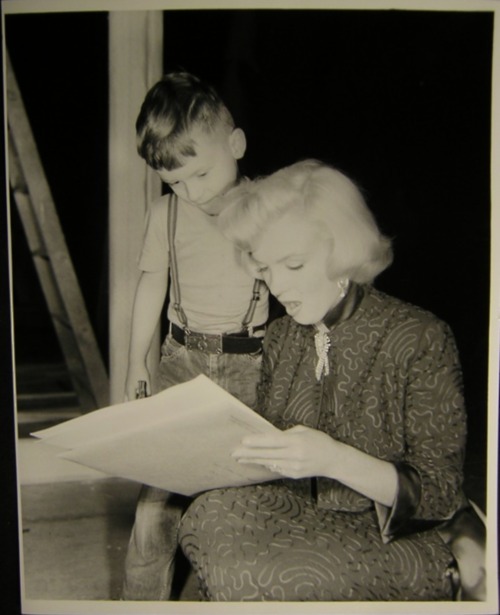 This kid is so fantastic (love him especially with Marilyn). I think he is by far the cutest kid on the block! YES! Definitely the cutest kid on the block! Wish he’d been in that group too. So happy to find other George Winslow fans! I adore George!! And I love that you’ve written about him here… it’s like you were reading my mind. (I just watched Room For One More Again and have been thinking about him and that performance). This kid is indeed a scene stealer, even from Cary. I have a big ole’ smile on my face right now, thanks to this post and the fact that I haven’t seen 1/2 of the movies he did make. More movies to watch! Yay! Great post. I can’t say much that hasn’t already been posted. Dito. I feel a great loss when I think of what he might have still given us all. I hope he found half as much joy in his private life as we had in him. 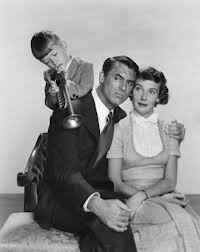 Our family went to many movies – Room For One More was our favorite because of Cary and “Foghorn”. Remember the scene, as I remember, Cary chasing after Foghorn, yelling, “Jimmy John, Jimmy John”. This was repeated many times in my household, Oh, Jimmy John, and we’d all crackup in hysterical laughter. He was someone that will never be forgotten. His last name is of Pomeranian origin. Also, he is of Wendish origin. Well done, George. Rest in peace.